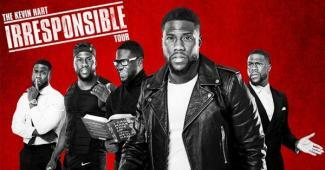 Kevin Hart is bringing his Irresponsible Tour to Minneapolis during Super Bowl weekend, Friday, February 2nd at Target Center! Use the code KEVIN starting at 10AM on Wednesday, October 18th for a limited presale. Kevin Hart has made a name for himself as one of the foremost comedians, entertainers, authors and businessmen in the industry today. After an electrifying performance at amateur night in a Philadelphia comedy club, Kevin quit his shoe salesman job and began performing full time at venues such as The Boston Comedy Club, Caroline’s, Stand-Up NY, The Laugh Factory, and The Comedy Store in Los Angeles. However, it was his first appearance at the Montreal Just for Laughs Comedy Festival that led Kevin into roles in feature films. 2017 has already been a banner year for Hart, his memoir I Can’t Make This Up: Life Lessons debuted at Number One on the New York Times Bestseller list and has remained on the list for nine consecutive weeks. The book also topped records on the Audible platform, selling over 100,000 copies in the first five weeks. Earlier in the year Hart voiced a title character in Captain Underpants: The First Epic Movie. To close 2017, Kevin will appear in the Sony reboot of the classic film Jumanji alongside Dwayne Johnson and Jack Black. In March of 2018, Kevin will star alongside Bryan Cranston and Nicole Kidman in his first dramatic role in the Untouchables for The Weinstein Co. Hart will soon begin shooting the feature comedy Night School for Universal, a film in which he co-wrote under the Hartbeat production banner and will also star in. The comedy follows a group of misfits who are forced to attend adult classes in the longshot chance they’ll pass the GED exam.